Abrasive or no scratch fibre coupled to synthetic sponge (polyester) or made of cellulose, available in different colours. 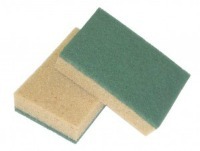 Tobacco sponge with high quality green abrasive fibre. 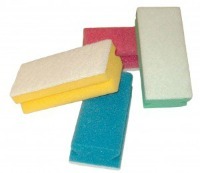 Polyester hand grip shaped sponge with white no scratch fibre. Colour code identifies the different use application. Yellow polyester hand grip shaped sponge with green abrasive fibre. Light blue polyurethane sponge with no scratch fibre. Cellulose sponge with green abrasive fibre. 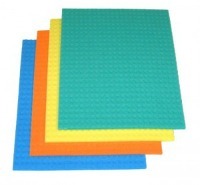 Cellulose sponge cloth in assorted colours. Colour code identifies the different use application.